Background subtracted light curve of the GX 5-1. The time bin is 2.3778 seconds at the SXT time resolution. The vertical lines mark the regions from which strict simultaneous spectra were obtained. Credit: Bhulla et al., 2019. Using the AstroSAT spacecraft, Indian astronomers have observed the low-mass X-ray binary designated GX 5-1. The observations were published March 28 on the arXiv pre-print repository. The authors report the detection of quasi-periodic oscillations in this binary and discuss its nature. X-ray binaries consist of a normal star or a white dwarf transferring mass onto a compact a neutron star or a black hole. Based on the mass of the companion star, astronomers divide them into low-mass X-ray binaries (LMXB) and high-mass X-ray binaries (HMXB). When X-ray light from these objects flickers about certain frequencies, such behavior is known as quasi-periodic oscillations (QPOs). Although many questions about the phenomenon of QPOs remain unanswered, it is believed that they occur when X-rays are emitted near the inner edge of an accretion disk in which gas swirls onto a compact object, for instance, a neutron star or a black hole. Astronomers hope that these oscillations could advance our knowledge the innermost regions of accretion disks. Located near the center of the Milky Way galaxy, some 29,300 light years away from the Earth, GX 5-1 is the second brightest persistent LMXB harboring a neutron star. In February 2017, the binary was observed by the AstroSAT spacecraft – India's first dedicated multi-wavelength observatory. These observations, using AstroSAT's Large Area X-ray Proportional Counters (LAXPC) and Soft X-ray imaging Telescope (SXT), allowed a group of astronomers led by Yashpal Bhulla of Pacific Academy of Higher Education and Research University in Udaipur, India, to detect QPOs in GX 5-1 and to collect important data regarding this object. "We present the analysis of an AstroSAT observation of the Z-track source GX 5-1. 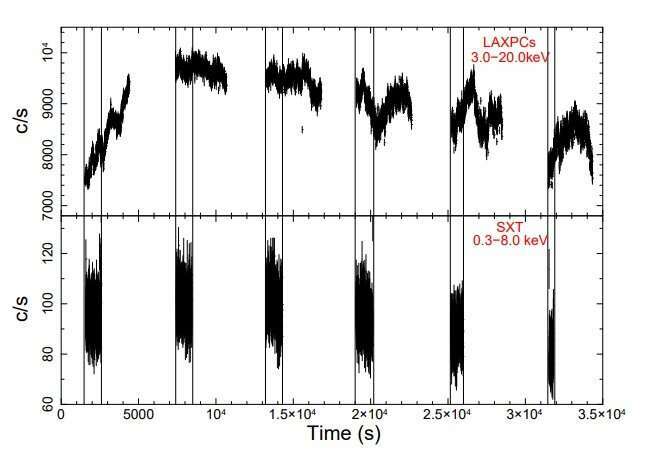 We used the strictly simultaneous SXT and LAXPC data to track the spectrum of a neutron star source as it moves along its Hardness intensity diagram (HID) and at the same time quantify the rapid temporal variability of the source," the astronomers wrote in the paper. The observations found that the power spectra of GX 5-1 show a strong QPO whose frequency changes from around 30 to 50 Hz. It was also found that time-lags between high and low energy photons are less than a few milliseconds, and that the QPO frequency increases, while its root mean square (r.m.s) decreases with disk flux ratio. According to the study, these results suggests that the detected QPO originates in the thermal Comptonized component and it weakens when the component is less dominant. "The results suggest that the spectral properties of the source are characterized by the disk flux ratio and that the QPO has its origin in the corona producing the thermal Comptonized component," the paper reads. The researchers concluded that more studies of GX 5-1, especially a detailed radiative modeling of its energy could be much helpful providing more details about the origin of QPOs in this system.